Grab the Super Deal from RummyCircle and win cash prizes worth Rs.2 lakh this August. Enter the website today and buy your ticket for Rummy Super 1 for a fee of Rs.50 and join the Rummy Super 2 tournament for absolutely free. Try your luck on the rummy tournaments and win cash prizes worth lakhs. 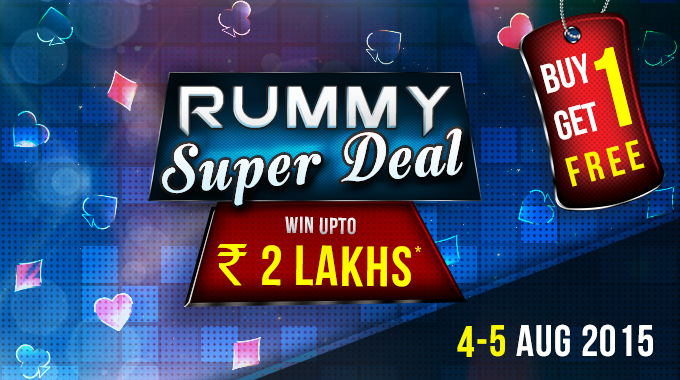 The Super Deal rummy tournaments from Rummy Circle will run for two days. The Rummy Super 1 will have an entry fee of Rs.50 and you can book your seat for the tourney on 4th August 2015 between times 1:00 PM and 6:55 PM. The tournament will start on 7:00 PM with up to 2000 players playing for a total pool prize of Rs.1 lakh. Once you have made an entry in to Rummy Super 1 with an entry fee of Rs.50, your entry to Rummy Super 2 is absolutely free. Just log in to your Rummy Circle account and book your seat on 15th August between 1:00 PM and 6:55 PM to get seated for the rummy tournament scheduled for 7:00 PM. To get the latest news on the best rummy tournaments to make big cash, subscribe to us. Got a feedback on our rummy review articles? Post your feedback in the comment section below.